The Pulsometer, a scale around the dial that allows doctors and nurses to quickly compute a person’s heart rate, has been used throughout watch history, but you’d be hard pressed to find it on any quality watch today. So, four French doctors, decided to combine their love of fine watchmaking with their daily needs while on duty, and the result is the Doplr watch (pronounced Doppler, like the Doppler Effect, which is used to study blood flow and measure its speed). “We put our heads together with a Swiss watchmaker to reinvent a Swiss-Made watch with old school medical functionality,” says Vincent Azzola, one of the four doctors. “The historical link between medicine and watchmaking dates back to 1707, when the first pulsometer watch was made by English physician Sir John Floyer and his watchmaker friend, Samuel Watson. Our goal was to reinvent this within a modern watch with the pulsometer, which links time and medicine.” The watch can also be used to count a patient’s respiration rate, using a separate scale. 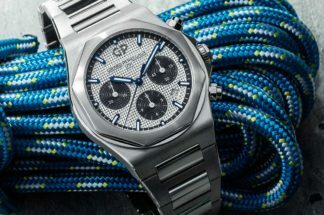 The first Doplr watch is a limited edition of 300 watches, retailing for 1,450 Euros, and they have already sold the first production run of 150 watches. The next 150 will be delivered in June of this year. The 40mm automatic watch, using an ETA 2824-2 movement, is clear and very good-looking, and comes with a black or a white dial, and the caseback can be personalized. The watch is designed to stand up to the trials and tribulations of everyday work in hospitals, or out in the field on the wrists of Doctor Without Borders.